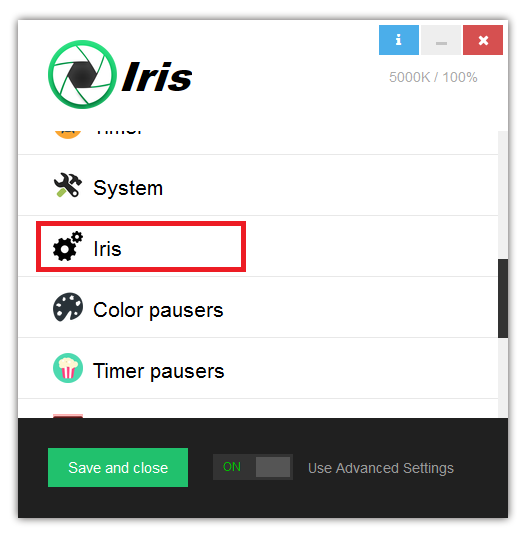 From here you can customize some general settings about how Iris works. If unchecked the close button will restore the last saved settings which is nice when you want to experiment with new settings, but don’t want to erase all your last settings. Uncheck this make the changes and if you don’t them just press X. If you are hackerish enough you can exit the Rest screen even in Strict mode by some combination of keys. Well if this checkbox is checked your entire keyboard will be blocked during the rest. This will only work on Strict mode and the only way to kill the Rest screen will be Restart. It’s nice for people like me who want to force themself to rest, but I’m warning you to use this with extreme caution. When you don’t move your mouse for 2 minutes the Work timer will be automatically paused until you move your mouse again. If unchecked no such checks will be made. One of biggest innovations of Iris over everything else is the High-level Color API. 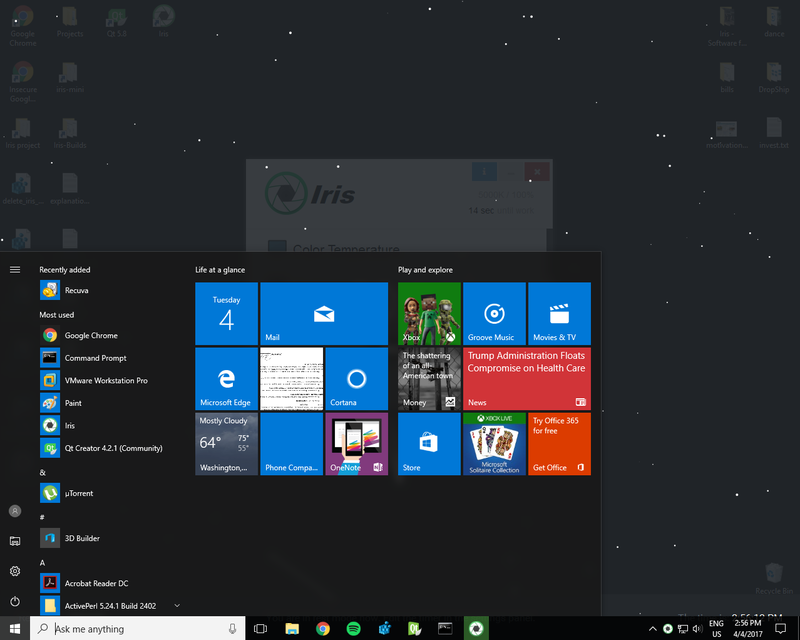 What this strange name does is that this will enable you to use Iris on monitors without graphics drivers. For example unchecking this box with make Iris works with DisplayLink and other docking stations. Iris will also work in Virtual machine althought I’m not sure why you would need this, but the docking station is important. Many users use monitors connected via USB and by unchecking this box you will make Iris work on them. Low-level Color API is enabled by default, because it’s faster and it’s best for the most users. 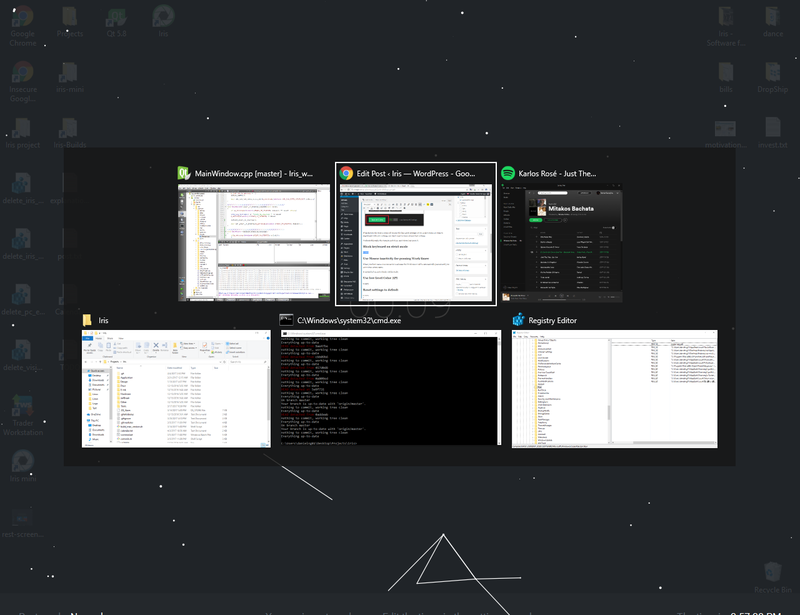 The low-level API works really close to the video card while the high-level is close the desktop rendering. Also some games doesn’t allow Iris to change the colors in Fullscreen and while windowed mode is solution, High-level Color API should work with them also. 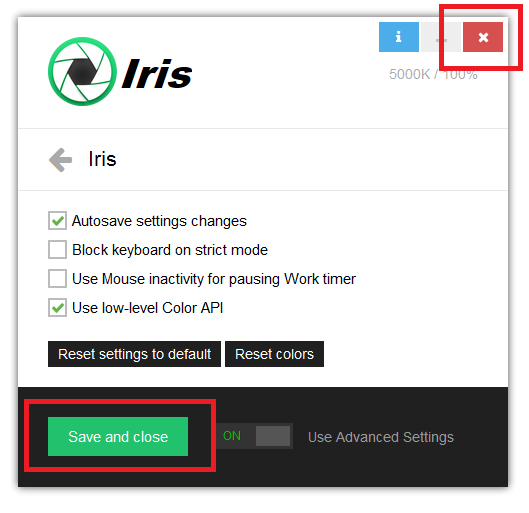 By clicking this button you will reset all options and customizations to Iris defaults. This is usefull sometimes where you don’t know why something doesn’t work or works strange. Iris has many options and while I try to make it as user friendly as possible sometimes you can click unwittingly something which makes the program look buggy. Use this button to Reset settings to Iris defaults. 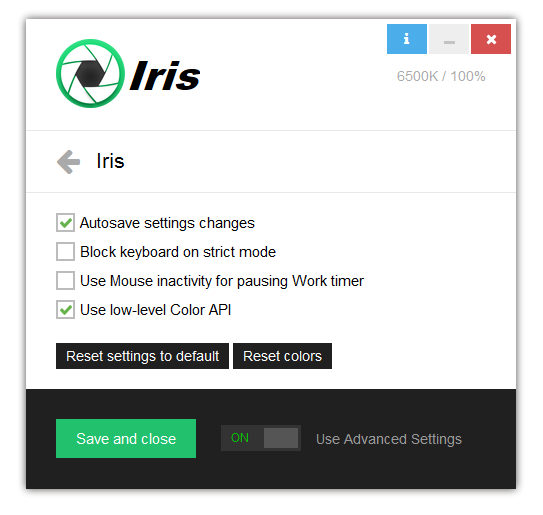 By default Iris respects your color calibration. I made this for people who work with colors and use proffesional color profiles. The point is that when you pause Iris your monitor will be perfectly calibrated, but imagine that Iris has crashed and the colors remain red. You start Iris again and even on 100% the screen is still dark or red. Clicking Reset colors will not respect color calibration and will reset colors to monitors default. This button is just in case something goes wrong. Use this button if at maximum values the screen is still dark or red.